Just got back early this morning from Segamat. 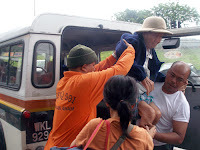 I was there for a few days escorting food distribution to victims of the flood stricken Segamat area. 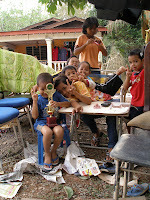 The consignment was contributed by Yayasan Salam and MAS EMC group. Together with us in the convoy are also members from MARES. I was so occupied that I forgot that today is Hari Raya. We had departed from Yayasan Salam's HQ in Petaling Jaya around 1230hrs. 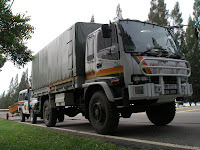 We then stopped at the Seremban rest area to wait for other consignments as well as team members to arrive. After having our lunch, we were informed that it might take a bit longer as they were still loading supplies into the lorry at KLIA. 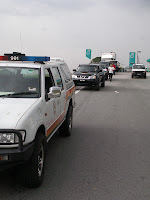 After much delay, we finally set off around 1630hrs in a convoy of 4WD, lorry, van & cars. 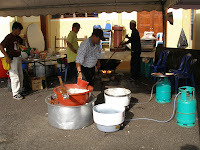 When we arrived in Segamat, we headed for our base, which was the Dewan Jubli Intan Baru. This shall be our 'home' for the next few days. 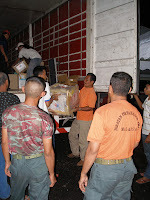 We unloaded the supplies, the NGOs did their logistic check and the MARES team set up their radio comm. The scene in Segamat was quite shocking. Yes, we had in our mindset that this is not going to be a 'normal' scene. However, the gravity of the situation even surprised us the 'flood resQ veterans'. 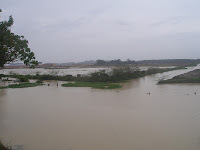 According to our local collegues, water level rose quite fast on that day and soon even they were caught in the flood. During the night, I went to visit the temporary shelters for the flood victims to enquire if there are anyone who needs medical attention. The segamat people are polite, even in their dire state that they were in. (Left) the 'mobile kitchen' busy cooking 700 packs twice a day. (Middle) teamwork in action - JPA3, MARES & MAS EMC. 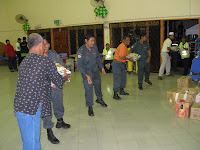 (Right) fahroe, abg aziz, jaz (MARES) and nooraini (Yayasan Salam) busy distributing food. Every meal time, the team distributed about 700 packets of food. Everything was done by the team members, including the cooking part. Here we have a group of people, who don't have to be here, but chose to be here to help their fellow Malaysians who are in need of their help. Senior managers, executives, business towkays...everyone did their part. Looking at them, makes me feel proud of my fellow Malaysians and I vowed to help them accomplish their mission in any way I can. 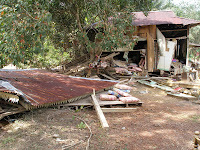 (Left) the house belonging to a nenek who stays alone, everything destroyed ...plus a severely sprained wrist. (Middle) the road that was 'swept' away...disconnecting Kg Pogo 3 from civilisation. 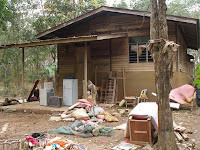 (Right) if u came back to a house like this, what would be running thru your head? 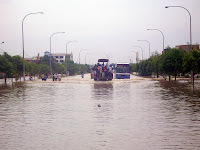 Like what I saw in Melaka, here too, people learn to adapt to this disaster. Some did complained that help arrived quite late, but they understood that at the rate the water level rose, even the very best rescuers in the world would find it impossible to save everyone all at once. Even during one of the excursions into the outskirts to deliver food and supplies, we had to deliver only half way as the road was swept away by the raging water. I was there at midnight and the road was still there. At 1700 hrs when we went there with the team, part of the road was missing. (Left) the wooden house in the background used to be on top of the green coloured brick wall...was swept away by the current. (Middle) teamwork...nooraini (Yayasan Salam) narrating while abg aziz (MARES) records on the video. (Right) our future leaders... kids, come what may, they are the ones who remains cool and oblivious. 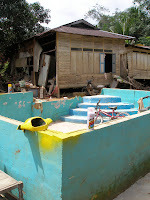 The team managed to talk to the Ketua Kampung who organized 3 boats pick up the supplies at the river near the mosque. By 1900hrs, the boats were no where in sight. 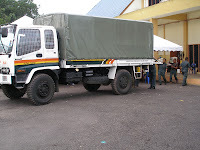 We had to act fast as apart from the dry ration, we also had 700 packs of cooked food. Amidst the darkness, the team leaders had a meeting and a decision was made...part of the team distribute the cooked food to the surrounding areas while a small team waited for the boats with the dry rations. Good decision. 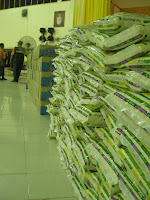 We went to distribute to just 2 housing areas (flood victims) and mission accomplished. Today, we parted with our local Segamat Unit. We made new friends..among them Rahman and Man, my 2 local friends who acted as local guides. On the way back, suddenly we heard 'takbir raya' on the radio. Azzat, Arif and me stared at each other. Then we realised that tomorrow is Hari Raya Korban. We are satisfied and begin to discover the true meaning of Hari Raya Korban...sacrifice. I had always wanted to jump on this blogging band wagon. Tried it on Yahoo 360 and kinda liked it. What I hope to achieve? Well, hopefully I can share with you an insight into my life. 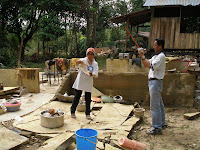 I just came back from 4 days flood disaster operation in Melaka. 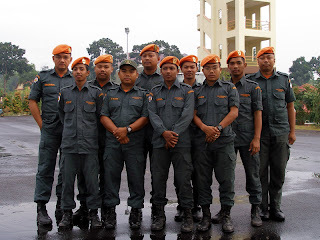 The call came at 0900hrs and I had slept at 0600hrs that morning because of 'Rukun Tetangga' duty here in my area. Our counterpart in Melaka had asked for assistance from us. By 1600hrs we were there in Melaka with 1 Land Rover, 1 Boat and 1 Hicom Handalan...plus 11 'team members'. The team from left....KAZ, Azzat, Zai, Yazid, Arif, Faisal, Mail, Shahir, Amal and Sham. What we saw was the human race adapting to a disaster...learning how to cope with the stress of loosing something valuable. There are those who completely ignore the calls for them to vacate their homes as the water level was rising. Some even turned aggrasive when asked to leave. These people think that they know everything. 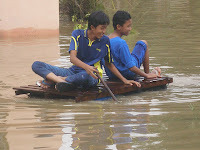 Yes, we sympathise that they lost something during the flood. What they didnt realised was that by doing so, and when the water level 'do rise' higher than they dared, they started calling us for help again. been spent rescuing other people. Sometimes we have to deploy the whole team to rescue 1 or 2 persons. The work is still the same....reach location, detach boat, row the boat to victim's location, rescue and re-load boat onto trailer. Don't get me wrong, we are there for the people in need. We worked until the wee hours for them. Anytime, anyplace, anyone. But next time if you are ever in a disaster situation and the authorities asked you to leave, just leave, as they are in a better position to assess your situation. So, that's all for now. I shall update this blog...when the urge to write overwhelms the urge to relax.